It appears as though a “Battle of the Maps” is heating up between Google and Apple. Last month, reports surfaced that Apple was planning to ditch Google Maps in its upcoming mobile operating system, iOS 6. In its place, Apple will allegedly use a new Maps app developed in-house. The new Maps app purportedly includes a 3D map view based on high-definition imaging technology developed by defense contractor Saab AB, which was then acquired by C3 Technologies, which Apple bought outright last year. Many expect Apple to debut its Maps app, along with the rest of iOS 6, at the Worldwide Developers Conference (WWDC), which kicks off June 11. 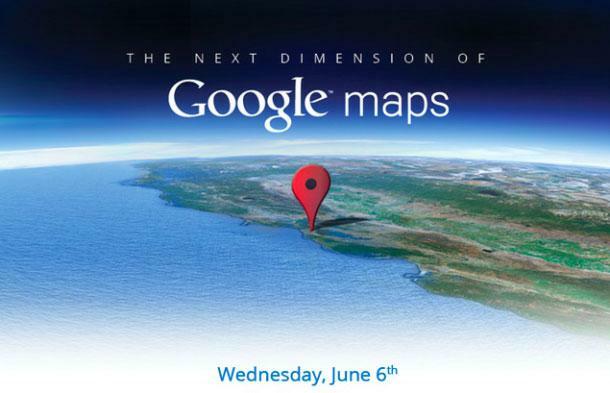 Then today, Google sent out invitations to its own map-centric press event, set just before WWDC, on June 6, during which Google promises to show off “the next dimension of Google Maps.” The invitation image (above) shows us basically everything we need to know: Google can do 3D maps, too. Because the Google event comes just days before the start of WWDC, many speculate that this means the rumors of an Apple-developed maps app are true. Of course, Apple’s Maps app remains unconfirmed (just like nearly everything else concerning Apple prior to an official announcement). In addition to a 3D mode, some speculate that Apple may build in some type of traffic monitoring service into the app. This rumor is based of off Apple’s admission last year that it is “collecting anonymous traffic data to build a crowd-sourced traffic database.” This, Apple said, would be used to provide iPhone users with “improved traffic services in the next couple of years.” It’s only been one year since Apple said that, not a “couple,” so that feature’s debut remains firmly up in the air. Regardless, it seems as though competition in the tech industry is pushing mapping technology forward at an increasingly rapid click. Regardless of who releases the best map app — Apple, Google, or someone else — users will clearly be the winner of this race. Whether or not that turns out to be iOS users or Android users remains the real question. Update: Citing a “credible source,” iDownloadBlog reports that Apple will not just release a new Maps app, but has also revamped “just about every stock iOS app.” The source added that changes to these apps are really the only major update in iOS 6. The source also said that all of the details about Maps have already leaked into the wild.